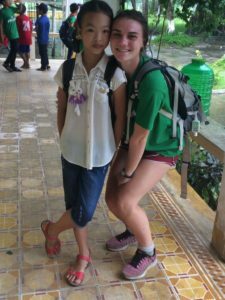 Our sixth conversation is with Carly Bonnet ’19, a member of the Princeton women’s track & field team who traveled to the Hau Giang Province – Hoà An of Vietnam. I was so excited to have the opportunity to represent Princeton, spend time with beautiful people and make a difference doing things that I love. I’m so grateful to the Princeton Varsity Club for making this possible for me. The food, eating with chopsticks, driving motorbikes instead of cars, the rainy season (down pouring rain every day), morning news on the loudspeakers throughout town, the early to bed and early to rise society, local shops, street food stands, clothing, weekly electricity cuts and the language were all very different from what I am accustomed to in the United States. The food was fantastic, especially the street food found at markets in the small towns and in cities. The daily dress consisted of much more modest clothing than we are used to in the U.S. despite the exceptionally hot and much more humid tropical environment. There is also much less of an emphasis on sports, which is why we were there, using athletics as a powerful educational tool applicable to countless areas of life. The language barrier was definitely difficult at the beginning, but we adjusted very quickly and learned how to communicate in the best way with the children. We had to learn to speak slower and remember to pause to let our Vietnamese friends/college students/coaches translate for us, and learned how to use body language to communicate most effectively. I was so surprised by how incredibly well we could interact using such few common words. Smiles, hugs and body language go such a long way. The children were my favorite part of my CFC experience in Vietnam. They were so kind, hard working, smart, energetic and fun, which made every day very rewarding. Each day we were greeted by kids running alongside our bus and giving us high fives and huge hugs as we got off. I created such meaningful relationships through smiles, hugs, piggy back rides, tickles, water balloon fights, and so many other seemingly simple daily activities. They brought gifts, food and drinks for us, made us beautiful jewelry from palm trees and gave so much. They are beautiful, generous, happy children with the biggest hearts. Our typical day started with a 5:15AM wake up, followed by a morning work out and breakfast before leaving by bus to get to school just before it started for the 6th graders at 7:00AM. We would then alternate between 40 minute teaching and coaching classes (for me that was Biology and Soccer, two of each in the morning, followed by a life skills class and team bonding with our life skills/core class), which ended at 11:00AM. At this time we would head back to the guest house for lunch and a nap. The second half of the day was a repeat of the morning but with 7th graders from 1:30PM to 5:30PM. After the school day we had dinner, showered and lesson planned for the following day. We had some free time together at night to head to the local markets and shops and journal before an early bedtime! After the last day of school all of the American coaches, Vietnamese coaches and a lot of the children walked and biked together back to the house of one of our children. We took turns pedaling and sitting on the back of our kids bikes, holding hands and giving piggy back rides as we walked by homes and rice fields. We exchanged “hi”s, “how are you”s and “I love you”s (which they knew in English) while a few of my kids Dat, Thai and Yen picked flowers, made grasshoppers out of palm fronds, whistles out of grass, picked flowers to put into my hair and bouquets, and shared fresh fruits from trees and plants on each side of the dirt road. We played peek-a-boo, and got really good at charades (a necessity without language). It was a beautiful culmination of the three weeks, seeing all of the love, happiness and trust shared between myself and so many of these children within a language barrier. For me some of the funniest moments were playing a game called pterodactyl with the kids and having the time of our lives running around sliding/jumping/swimming/wiping out in the mud playing soccer in a huge rain storm during the last week of camp. I’ve definitely learned to slow down. From the speed at which I speak to the way I pack my schedule and run to and from all of the places I need to be. I have an increased appreciation for the simplicity of a slower-paced life. What is the most important thing you learn/realized from this opportunity? I think that I have a much greater global perspective. I can’t say that I am surprised by the fact that after our three weeks, Vietnam feels like a home to me now, but its incredible that physically, I could not have gotten much farther from my home on the east coast. It was nice to see it reinforced, that while we all come from such different cultures, speak different languages and eat different foods, we are all people and we have so much more uniting us than differentiating us. The world feels like a much smaller place. I would highly highly recommend CFC to everyone! I’ve never felt so immersed in and a part of another culture. I am in love with the humble, selfless, generous, loving people, the incredible food, the beautiful region and so much more. It is a fantastic opportunity to learn about another part of the world, people and yourself.